A. 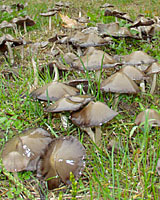 Mushrooms by the dozens to hundreds are often common in the vicinity of the stumps of trees that have been taken down and along the path of roots leading from trees in various states of decline. This occurs most often during cool, damp weather in both spring and fall. What's happening is that a wood decay fungus, that if you could dig up its entire thread-like structure and weigh it, might tip the scale at hundreds to thousands of pounds, is gradually consuming the carbon within the remnants of your mother's tree, including the roots that were growing out into her lawn. Cool, damp weather the past several weeks has triggered the fungus to form above-ground "fruiting bodies." These fruiting bodies, that produce and release countless spores, are the mushrooms in her lawn. To answer your question specifically, there's really nothing she can do to prevent the spread of the fungus, and the occasional appearance of its associated mushrooms, as it decomposes whatever remains of the roots of her tree. 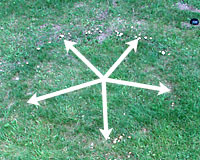 In fact, as some soil-borne fungi expand, their fruiting bodies - i.e., mushrooms - may form circles called “fairy rings.” It may be difficult to see, but the arrows in the picture at left are pointing to clusters of mushrooms that are part of a fairy ring in a lawn! Legend suggests that these mushrooms appear where magical fairies have danced in a circle! However, more likely, fairy rings begin when a fungus becomes established and starts decomposing a carbon-rich piece of organic matter such as a dead tree root, a piece of wood buried after the construction of a home, or a thick mat of thatch in a lawn, below left. Once the fungus has consumed the initial piece of organic matter, it spreads out in all directions at a rate of several inches to several feet each year in search of new sources of organic carbon. Some fairy rings have been documented as expanding continuously for hundreds of years, reaching diameters of several hundred meters! In a worst-case scenario, patches of grass at the outer edges of the advancing fairy rings may be killed. 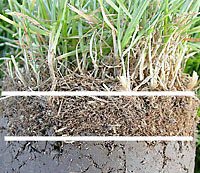 This is thought to occur when the fungi’s below-ground structure becomes so dense that water is unable to reach the roots of the grass in these areas. Once the bulk of the fungus grows beyond these areas, the grass gradually recovers with proper mowing, fertilization and core aeration. If you’d like to learn more about fairy rings, you can find an excellent animated description of this natural phenomenon at the “Fun Facts About Fungi” website. The good news in all of this is that the mushrooms won't damage your mother's lawn. And, they'll eventually disappear once the roots of the deceased tree are completely decomposed. In the meantime, she can simply break them apart with a rake every couple of days if their appearance is bothersome. Otherwise, just run them over with the lawn mower.